At 0657 on May 11, 1945, Ensign Kunihiro Moroi took off from Kanoya Air Base as pilot in a Zero fighter carrying a 500-kg bomb and died in a special (suicide) attack off Okinawa at the age of 23. He was a member of the Kamikaze Special Attack Corps 5th Tsukuba Squadron. After his death in a special attack, he received a promotion to Lieutenant. He was from Nara Prefecture, attended Kokugakuin University in Tōkyō to study history, and was a member of the 14th Class of the Navy's Flight Reserve Students (Hikō Yobi Gakusei). It already has been a few days since I came here to the largest southern air base. Curiously I have been able to live a long life, and I am still here. Today the sortie that I thought that I would make did not happen, but tomorrow is not known. When I make a sortie one time, we five young cherry blossoms will make taiatari (body-crashing) attacks and will fall together with bombs in our country's manner. I truly am fortunate that the plane that I will be able to go in is a cutting-edge combat fighter. Only God knows my current mental state. Every day I dream of the family. Before long my spirit most likely will return home. When I fly my plane, I forget just about everything. It's good. I leave praying for the Empire's prosperity and your good health. Postscript - I think that my bags will be sent by men at Tsukuba. They are a wicker suitcase and an overnight bag. I think that soon my photos will be sent by someone. Farewell. The letter comes from Katabami (2014, 92). The biographical information in the first paragraph comes from Katabami (2014, 92) and Osuo (2005, 198). 1. Yasukuni Shrine in Tōkyō is the place of enshrinement for spirits of Japan's war dead. Katabami, Masaaki. 2014. 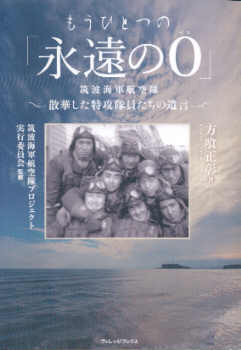 Mō hitotsu no "Eien no Zero": Tsukuba Kaigun Kōkūtai (Another "Eternal Zero": Tsukuba Naval Air Group). Tōkyō: Village Books.